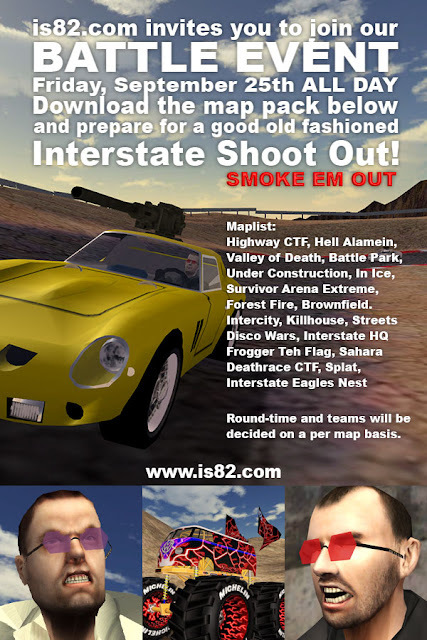 You are invite to be one of the part of this great Fun Mod "Interstate 82". The Event start comming Friday 25th September at 8 pm CET. It's possible, that the most action goes 00 am CET on. Please take a look at the begin of Friday and the end of Friday. For this event, there are some content Download able, to have lot of fun on the tricky Parcours. You can Download this Fan Package, what we have link for you and after than you will be in game! buschhans wrote: The Event start comming Friday 25th September at 8 pm CET. Looks like it will begin at 2 PM CST (Central Standard Time) on the 25th for anyone who is in that general time zone. Thank you Swaffy, i will take a view of the time by the next event. Yesterday we have play the "Eve of Destruction 2.51" Mod monthly Charlie don't Surf Event. We were 20 People on the Server, we had a lot of fun. Thanks. I have been so sick lately I can't talk and my mind is foggy. If I missed any recent events, hope you understand. Ruuga wrote: I have a lot to tell about FinnWars 1918's development but not enough time. So I try to sum up everything in couple of sentences. I didn't manage to send buschhans an alpha-version of the mod in time as I had planned. I just have too much things to fix before I can send a test version to anyone. The problem with these glitches is that it may take betatesters's attention away from searching the real problems in the mod that I haven't noticed yet. I'm starting my military service next monday and I can't develope this mod for couple of weeks after that. Usually the first two weeks or so are the worst and busiest time in military service in Finland. Or that's what I've heard. After 2 months of service I should have even more free time than I have now as a civilian labourer with 12 hours of work per day. So then I can actively start developing the mod. I hope I can send an alpha version of this mod to all volunteer-testers as soon as possible but it may take even a month or two. one year is going over the landscape. How do you do? Whats about new in FinnWars 1918? Is there an alpha Release, to test that content?